This entry was posted on Tuesday, April 9th, 2019 at 8:07 am. Staff members: Tom Langley, Cameron Kaye and Jody Wiltshire. 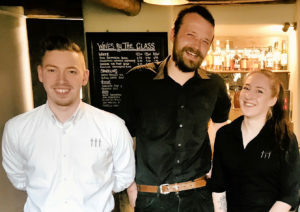 THE three Daggers in Edington took home the crown as ‘Pub of the Year’ in the Wiltshire Life Awards, which took place on Friday 29th March in Salisbury. The Wiltshire Life awards are a way to celebrate excellence across the county with businesses, charities, individuals and community groups praised across several different categories for their work in the county. The village pub beat second place: The White Hart, in Atworth and joint third place: The Greyhound, Bromham and The Three Crowns, Chippenham. The Three Daggers also boasts a 5* B&B accommodation above the pub, a farm shop with fresh local produce, their own microbrewery and a luxury house and spa on the hillside for exclusive use.